Finding time to meet friends for lunch can be hard. We get busy. We go about our routines and somehow manage to over fill our days running from one commitment to the next. We have great intentions, yet finding time to sit and truly enjoy one another’s company is a luxury we do not often grant ourselves. Daily conversations with co-workers and the Starbucks baristas become routine and repetitive. I am no different. No matter how many resolutions I set to live with purpose, act with intention and be present I still gravitate to the somewhat meaningless to-do lists, Facebook updates, Tweets, emails and texts. I blur what matters with what doesn’t. Yet I recognize that there is nothing I enjoy more than deep, genuine conversation. Perhaps that’s why I am so drawn to the Downtown Eastside of Vancouver. On Hastings Street, the sense of urgency disappears. Technology is scarce, to do lists do not exist and there is no one to impress. There are no false pretences, no fancy brand names, and no $4 lattes. People are everywhere. People have time for genuine conversation and they long to connect. Yet, in a cruel twist of reality, these are the people we ignore. We drive by. We lock our doors. We think of addiction as a choice and we somehow justify that we are different than ‘them’. We label them. Homeless. Addicts. Bums. Crack-heads. After-all, they are not ‘us’. We could not end up there. Not only are we different from them, we know better. We credit our own success with the choices we have made. But what if none of that is true? What if each person on Hastings Street is our equal? What if each of ‘them’ demonstrate an admirable amount of resiliency simply for surviving the painful circumstances of their lives – circumstances we would not wish upon our worst enemy? What if each person wandering the streets deserves to be treated with empathy, love and compassion? What if every one of ‘them’ has a story worth hearing, a heart worth healing and a soul deserving true human connection? What if they need more than just food and shelter? What if they are just as human as you and I and deserve the respect and dignity that we grant our closest friends? What if they are actually worthy of our time – time to meet for lunch? This is how ‘Beyond HELLO’ began. In the short conversations my students and I have had with the homeless over the past five years with Project HELLO (giving people on the streets the opportunity to write greeting cards to long lost loved ones) we have witnessed pure beauty. We have experienced many tender moments where faces have softened, eyes have sparkled and glimmers of hope have resurfaced. In our short five minute conversations we have heard the headlines to deeper stories. Stories worth our time, and stories worth sharing. With ‘Beyond HELLO’, alumni from Project HELLO and I have set a goal of meeting once a month to take someone from Hastings Street out for lunch. In exchange for a warm meal, we will empower them to tell their story. And we will listen, offering a commitment to share their story with others, in the hopes that doing so will soften the hard edges society has developed separating ‘us’ from ‘them’. Here is an account of last Wednesday’s lunch. Lunch with Garth. Armin (grad 2011) and I met in Coquitlam and drove to the Downtown Eastside. Like the first month, we had no idea how we would choose someone to to take for lunch. We know from our work on Hastings that many people stick to the same city block for weeks on end. Since we have chosen Save-On Meats as our restaurant of choice (based on their awesome environment where everyone is welcome and their commitment to the neighbourhood), we decided that we should pick someone within one block of the restaurant. In a somewhat awkward style we walked the first block observing the neighbourhood. Like always, we tried to be unobtrusive, yet just by the way we dressed we stood out as strangers. With a pang of guilt knowing we could not help everyone, we scanned hundreds of faces wondering whom to approach. A tiny older lady in a yellow sweatsuit and messy ponytail caught our attention. Despite many missing teeth, her smile is radiant and her eyes are alive. We approached and said hello. We explained who we are and asked if she would like to join us for lunch. She smiled her big, wide smile but explained she could not join us because she had already eaten and because she was busy working. We asked what she was doing. She told us she was selling drugs so she could get enough money to bake cupcakes. To the streets, she is known as ‘Fudge’. She loves to bake, and if she sells enough drugs in a day she uses her extra money to bake cupcakes which she then hands out on the streets. She beamed with pride as she explained how much people love her cupcakes. Fudge couldn’t join us, but she was eager to spread our goodwill. She pointed to a friend of hers who was approaching us, hunched over a walker. She introduced us to a quiet, humble man named Garth. I have to admit, I may have looked past Garth as he didn’t stand out in the crowd. She explained our offer, and Garth told us he would need a second to take it all in. He was stunned. He turned to us and said “I don’t know if I am the best person – I might not like the lunch they are serving today.” We told him that he could order from the menu and he could pick his own lunch. With bewilderment, he told us he could not believe his luck as no one had taken him to a restaurant in fifteen years. In seconds, Garth started to share his story, often at a rapid pace, describing his own journey woven in with historical facts about Vancouver. His only concern was that lunch may not be enough time for him to tell his story. We entered Save on Meats and asked for a table for three. We waited a couple minutes for a table to clear. Some restaurant patrons glanced inquisitively as Garth’s appearance is toughened from the drugs and street life. We made our way to a booth and glanced at the menu. With childlike enthusiasm Garth asked if it would be ok to order french fries and a milkshake. We agreed and placed our orders. I took some time to explain Project HELLO and Beyond HELLO and ask Garth’s permission to tell his story. Not only did he agree, he was proud of this new role, all of a sudden feeling a sense a purpose. Something he hasn’t felt since his days at an mail sorter with Canada Post. Despite the circumstances and battles he faced outside of work, he always felt a great sense of purpose once he got to work. His face brightened as he told us eagerly about the places he has worked: an extra on Beachcombers and 21 JumpStreet, a security guard at Expo 86 and a 20 year graveyard employee with Canada Post. Garth described himself by saying “I’m a simple guy. I’m a passive person – just don’t piss me off. All I ask from others is that they don’t lie and don’t steal.” We agreed to those terms and began to get to know one another. Garth grew up in poverty, living in one of Vancouver’s first Co-op housing units with a single mother and three siblings. His father worked on the tugboats but was not around much. Garth wonders if his father is still alive. His mother worked hard to raise their family but she was not the warm and affectionate type. Garth reflects on his childhood and how much his mom’s hugs would mean to him. As he got older his mom was not the ‘huggy’ type but she would often say to him “let me put on the kettle and make us some tea.” To Garth, his mom’s tea and shortbread cookies meant the same as a hug. This is something he misses dearly since his mom past away many years ago. Around the time of his mother’s death a falling out occurred between Garth and his siblings. Battles over the will and the distribution of mom’s limited possessions left the family fighting with one another. This was the last time Garth saw family. Shortly after his mom’s death, Garth was in a major car accident. He was hit head on. The impact caused his tools from the back seat to fly forward and hit him from the back. It took emergency personnel hours to rescue him from the vehicle. Garth endured a sixteen hour surgery to overcome the impact. Miraculously he survived. He now walks with a walker and has a metal chest plate to help with stability. He also contacted Hepatitis C through a blood transfusion. As he told us this he chuckled at the irony – that he is now an addict on the Downtown Eastside yet his Hepatitis is from a blood transfusion. Wondering why he was still alive after his mom’s death and his car accident, his life lacked meaning. That feeling lasted until the day he was at Metrotown Mall and he met his soul mate Sylvia. Like his mother’s hugs, Sylvia provided comfort to his life. The two married and lived together in the Eastside of Vancouver supporting one another. In 2001, Syliva became quite sick needing Kidney dialysis. Garth supported her around the clock helping with her medical care. One evening he asked a friend to help so he could go out for a couple of hours. He returned to discover his wife dead. His friend had decided it was best to end Sylvia’s suffering by holding a pillow over her face. In an absolute rage, he walked the streets for 72 hours not knowing how to move forward. He turned to drugs for comfort. As described by Dr. Gabor Mate, heroin often provides the same feeling as a warm, soft hug – the exact feeling that Garth was missing from his life. Garth has continued to have his own medical struggles. He described one incident when his lungs filled with liquid and he was essentially drowning. He was again hospitalized but once again lived to tell about it. He credits his pain management skills to his training in judo and karate as a child. He is proud of his ability to control his mind enough to separate it from the physical pain. He is also proud that he dreams in colour. Through conversation, Garth asked if we could try to find his sister Lisa. She is fifteen years younger than him and he essentially raised her when their mom was sick. She called him ‘Uncle Garth’. He let us know that just recently he has been wanting to re-connect with her. He tried asking the RCMP to help but they were unable to help without a valid reason. He is hopeful that we can help. So far, despite our searches, we have not found Lisa LaBrash (born in 1976). We will continue to try. We thanked Garth for taking the time to tell us his story. I decided to apologize openly to Garth for the judgement and lack of understanding given to their neighbourhood. He understood and agreed that more is needed. Yet then he smiled and said, “you know we judge you too right?” I ask him what he meant. He told me that from my clothing and the way I held my notebook he had determined I was a cross between a social worker and a cop. I corrected him and let him know I am a Vice Principal at a high school. His face lit up and he chuckled – “see – exactly – a cross between a social worker and a cop!” I smiled at his wisdom. We exchanged contact information and agreed to be in touch. We thanked Garth for sharing his story. He thanked us, still amazed that someone had taken the time to buy him a meal and listen to him for a couple of hours. We left with a handshake and a smile, grateful that we had taken the time to go ‘Beyond HELLO’, genuinely connecting with friends over lunch. This entry was posted in Community, homelessness, Uncategorized. Bookmark the permalink. 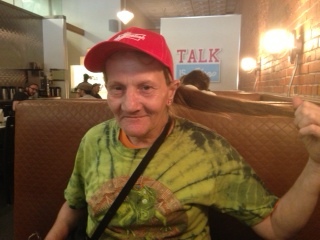 Another wonderful account and insight into the life of another soul in the Eastside………how amazing for them to sit down, share a meal with you and spend time reflecting on their lives….thank you Kristi for sharing this therapeutic and meaningful time with us all. Thank you so much for sharing Kristi. Your blogs bring out such raw emotion that I find myself welling up each time I read them. Please continue this amazing initiative and I hope you find Garth’s sister. Amazing and riveting. I loved your observation of ” we have heard the headlines to deeper stories” You are telling their stories in such a profound way that we all want to help, narrow the gap, and look at the VES with new eyes. well done! I’m crying over my tea Kristi. Thank you for sharing Garth’s story. I’m so looking forward to getting another group of kids involved with your project this year! Hi. I’m a bit confused by your comments. I am in constant contact with Garth’s family and they are not seeing the discrepancies you are implying. The story I have told is Garth’s story on the day I met him. If you have information or contact with Garth and feel something needs to be edited please let me know. Why do you feel his story is not truthful? I came across your blog accidentally and realized that I knew Garth when he lived in the Co-op. I met him early in my addiction and hung out with him for awhile. We lost contact after he met Sylvia. I hit my bottom 9 1/2 years ago and went into recovery. I am now clean and have a good life. I’ve always felt that I owed Garth an amends and wrote him a letter back then which I still have. I would like to see him again to catch up in our lives but do not know how to contact him. Would I be able to send that letter to you to give to him? I don’t expect an answer from him but I could give you my email address so you can let me know that he did receive the letter. Thank you for your help in this matter. Hi Karen – thanks for your note. Can you email me at kblakeway@sd42.ca and I will sent you his contact information?